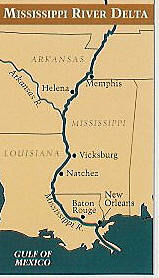 Rivers and Railroads have been competing along the Mississippi River since Abraham Lincoln and the steamboat EFFY AFTON! 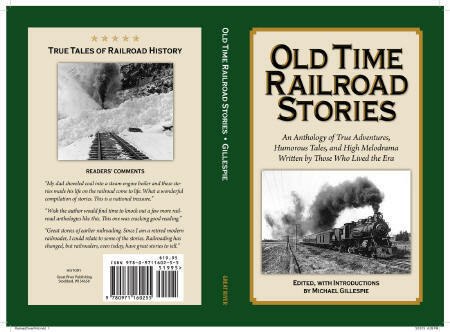 Our newest publication is for all those RAILROAD BUFFS who've requested a collectable version of Mike Gillespie's new addition to his "Steam Era" collection. Michael offers the same thorough yet entertaining attention to historic accuracy that characterize both COME HELL OR HIGH WATER, and WILD RIVER, WOODEN BOATS! Full index, full glossary, and dozens of historic photographs! An Anthology of True Adventures, Humorous Tales, and High Melodrama Written by Those Who Lived the Era! Every volume of DISCOVER! is filled with a variety of fascinating Mississippi River fact and lore. All Volumes contain info on birding, wildlife viewing hotspots. 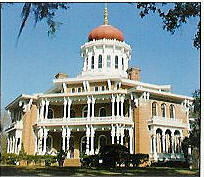 Each highlights Geography, interpretive history and natural history attractions along the Great River Road. JUST RELEASED! All new format, hundreds of updated and expanded entries, new photos, maps, charts, and INSIGHT FEATURES. St. Paul, Minnesota to Dubuque, Iowa. By River Author, Pat Middleton. ISBN 0978-0-9711602-2-4 $19.95 240 travel-packed pages! 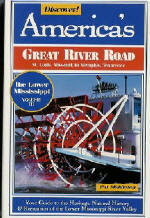 THE indispensable guide to traveling the Mississippi River and the Great River Road. 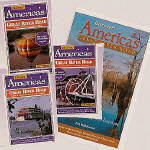 River access, B&Bs, riverside cafes, historic & natural history notes. Travel insights for the Great River Road from Dubuque to St. Louis. Nauvoo, Hannibal, the Quad Cities and more! Recommended by the St. Louis Post-Dispatch, The Washington Post, The Wisconsin State Journal, the Des Moines Register and many many other regional newspapers and magazines! "This book is must-reading! Pat Middleton has done super writing and research. The book is impossible to lay down for all the information it contains." ~ Orville Meyers, long-time host of Iowa's radio and television program, "Along the Outdoor Trails." Heritage & natural history along the Mississippi River from St. Louis to Memphis. The New Madrid Earthquake, the French Historic District, and Paducah, Kentucky--it's all in there! 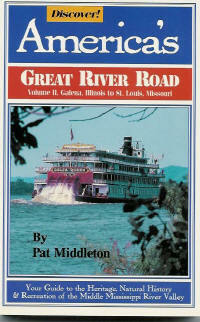 "I drove the Great River Road with this volume at my side. When we passed out of its parameters, we felt a sense of loss." ~ Reviewer, St. Louis Post-Dispatch. 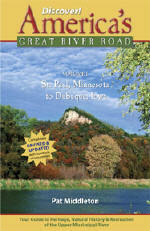 Click here to see more of our quality river books and gifts! A new release by the veteran Riverlorian of the Delta Queen Steamboat Company. To my mind, "Toots" was the face of the riverboats for some 35 years. With this memoir, she serves as our eyes, ears, and heart as she participates in the last cruise of the Delta Queen on its way to Tennessee. Return to www.GREATRIVERARTS.com/shopping/ for more riverbooks and river art! 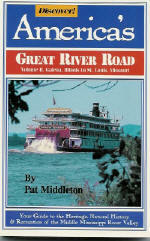 Return to www.greatriver.com "The top rated Mississippi River Home Page since 1995!"